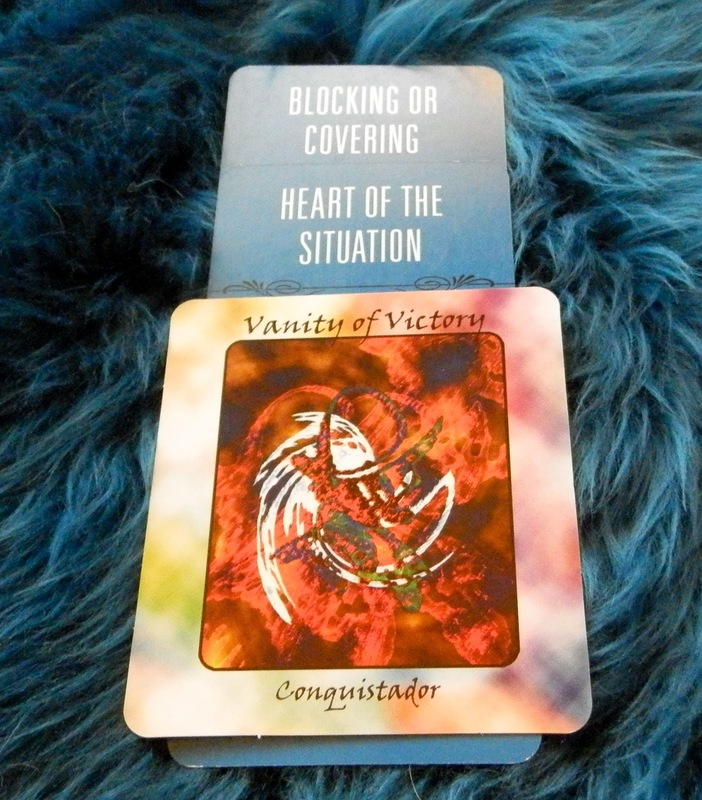 Today's Draw: Conquistador/Vanity of Victory from the Rock and Roll Oracle in the What's Blocking the Heart of the Matter position from the Deck of 1000 Spreads. Could the battles you fight in your daily life be distracting you from seeing the war? Could fighting those battles actually end up being a losing proposition? If you pulled back and viewed the greater war, might you then uncover what you're really fighting? So the question was about a recurring interpersonal issue that crops up in my life. And I feel like I've given this issue a lot of thought and tried changing a lot of things—the way I view I situation internally, the boundaries I draw with others, the way I enter into the dynamic, etc. And it just keeps happening. I feel there's improvement in the situation, but I think there's something I'm meant to learn that I'm just not learning yet. I feel that if I tighten my boundaries more or make other further adjustments that I'll just be going too far in the other direction from balance and "healthy". So I guess I feel I'm a at a point where I've changed my behaviors and attitudes enough. So there's just something I'm not understanding, otherwise these situations would cease to present themselves to me, right? At least that's how I believe spiritually. So having the combo of Blocking or Covering and Heart of the Situation is very appropriate. There's something I'm not seeing past. And this Conquistador card is talking about winning the battle, but losing the war. That's exactly what I feel like is happening! So getting this card combination has opened up a few more thoughts about the situation to me. The details of the situation don't really matter, because I think the lessons are universal. In my particular recurring "battle"I can see where I'm playing defense...either responding to situations as they present or arranging ways to ensure situations don't present. I'm letting the other team carry the ball, so to speak, and I'm blocking and tackling and whatever else that goes into play defense. But what about my offensive game? I suppose you could liken it to the polarity of giving and taking...you can't always be giving. And you can't always be taking. You have to know and appreciate both sides. Givers have to allow themselves the pleasure of taking, and to do that, they have to get past the discomfort of taking without giving in return. And takers need to know what it means to give without expecting in return. We need to learn to play both sides of the field. And then we'll find others who know what we know and dynamics will be more balanced. So "learning to play both sides" is one "front" in the bigger war. Another "front" in my particular war is this. You often hear people say, "I don't care what you say, it's what you do that has meaning to me." I understand that logic. But I think we can all use to pull back a little farther and see beyond the battle of say vs. do. There's a whole other level beyond that—motivation. Why is the individual saying and doing what they're saying and doing? We can't always know the answer to that. But every action in every situation has a motivation behind it. There are many people out there who say and do all the right things just to get what they want. Maybe they were raised in an addictive, unhealthy or "survival" situation and that's the only way they know. In a situation like that, there's a lot of work that person will have to do before they can be any other way. Or maybe they have an actual pathology around it that will never change. I'm guessing we can all look back on a friendship with someone who knew what to say and how to act. And maybe we thought to ourselves at some point, "something's off here, but I don't know what it is. Maybe I'm just paranoid." You have nothing other than your intuition to base your opinion on. Some of it may be that you want to believe otherwise because it suits you. And some of it may be second guessing yourself. And some of it may be the cunning of the other person. Regardless, you put both what you see and hear before what you "know"...or think you know...inside. That's another front in MY personal war. And we also have to ask ourselves, "what's MY motivation?" What do I think I'm getting from this person that keeps me tied to them? Why do I stay when I want to go? Do I have a problem saying "no"? Am I afraid they won't like me anymore? Does it keep me trapped in one of my comfortable, but toxic, cycles? Why do I want to believe that what they say and do is true, over my intuition that it's not? Anyway, I guess what I'm saying is that some repeating cycles are harder than others to figure out. And it may be because we're winning battles here and there and not seeing that this recurring cycle and that recurring cycle and the other recurring cycle over there are all part of a much bigger war—a war that's being fought on many different fronts. So the very reason for each of these smaller repeating cycles—equity in relationships, trusting my inner voice over appearances, and staying in unhealthy dynamics too long, for example—is to lead you to fighting a much larger war called "making yourself and your needs your top priority" or "standing up for yourself" or whatever your particular thing might be. And maybe if we shift our focus to fighting at the level of "the war", all the smaller battles will fight themselves.